Doctors Khraizat, Bui, and Al-Aouar are expertly trained in routine and complex gynecologic surgical procedures. 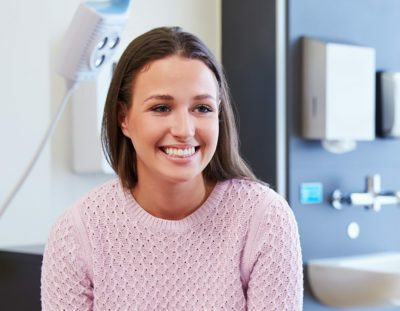 Whenever possible, they use advanced minimally-invasive surgical procedures for gynecologic issues such as heavy periods, leaky bladders, fibroids, endometriosis, and permanent birth control. These minimally invasive techniques significantly decrease scarring, recovery pain, and downtime. If you are looking for advanced and cutting-edge care, you have found the right practice. Our doctors pioneered robotic-assisted gynecologic surgery at Beaumont Hospital-Wayne using the da Vinci Surgical System. 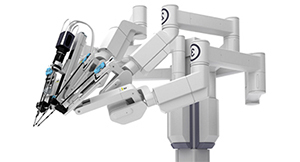 This system’s advanced robotics technology translates our surgeon’s hand movements into more precise movements of tiny surgical instruments inside your body resulting in unparalleled precision and control. Hysteroscopy and laparoscopy let our doctors look into the womb and abdomen, respectively, to find the cause of pelvic pain and gynecological issues and to investigate infertility. In addition to simply looking inside, our doctors can also perform minimally-invasive surgery to treat cysts, endometriosis, and fibroids, and perform a D&C, uterine ablation, sterilization, and more. Want to learn more? Below you’ll find a list of surgical procedures and conditions treated by Michigan Women’s Care. Please click on a topic to view details. Votiva, Better than Kegel Exercises? Our licensed and board-certified OB/GYNS provide personalized prenatal and postnatal obstetric services in Canton, MI. We diagnose and treat a full range of gynecologic and women's health issues and provide family planning options. We offer Votiva treatments to quickly and painlessly increase vaginal sensitivity, tightness, moisture, and muscle tone. We provide BRCA genetic testing, clinical breast exams, and screen for and detect gynecologic cancers. Great doctor! I’ve seen a lot of ObGyn doctors, because of tons of female issues. He is the best! He always listens to your problems, explains everything in depth, kind, caring, knowledgeable. Such a kind, compassionate, loving doctor. I switched to him mid-pregnancy and he was nothing but phenomenal. He takes pride in his profession and it is well apparent. I highly recommend him! Wouldn’t go to anyone else! The staff at the facility is also very welcoming and caring. They treat you like family! She (Dr. Al-Aouar) had spotted a life threating problem and saved my life.. She insisted that I go to the ER and once I was there she came to check in on me and make sure I was ok.. I was treated like a family member not just another patient.. I love Dr. Bui. She and her team are so caring and very thorough. She is up on the latest information and can recommend the best treatments. Thank you Dr Bui. Received great service and follow up from Dr. Bui and her staff. Never had to wonder whether I was receiving the correct info and Dr. Bui provided all forms of option and allowed me ample amount of time and to make an informed decision. Could not ask for a better Dr.
Dr. Khraizat and Dr. Bui are the absolute best; they kept me comfortable, relaxed, informed & treated my family great! Drs. Khraizat and Bui are excellent. Both are “tens” on this 5 point scale. I could not have asked for a better experience. Dr. Khraizat is phenomenal, I have been seeing him for over 4 years and he is the best in the industry. I have been going to Dr. Bui for my women needs for probably about 10 years and she is excellent – the best doctor I have ever had. I wanted a woman dr. and she is personable and caring and knowledgeable, especially with my specific issues. Very, very happy with her. Dr. Rula N. Al-Aouar is an excellent doctor and great manners! She delivered my first baby and it couldn’t have been any better. Dr. Khraizat is the kindest man, he cares about his patients’ health as well as their emotional needs. I am so pleased with his care. I am a 70 yr. old that has been his patient for 5 yrs. He is an excellent Dr.
Dr. Khraizat is a wonderful Dr. my family and I were very pleased and impressed. I recommend him to all my friends and family. Dr. Bui and Dr. Khraizat are the best doctors that I can ask for. Very respectful, kind & went above & beyond to help me during my pregnancy & delivery. Great office. The staff are very friendly and fast. Dr. Bui is very nice and has a great bedside manner. Makes you feel at ease and explains things to you, without making you feel stupid or bad. Sign up for our newsletter and get our latest news, promotions, and relevant women's health information delivered to your email inbox. Michigan Women’s Care is the OB/GYN practice of Dr. Essam Khraizat, Dr. Lan Bui, and Dr. Rula Al-Aour. We specialize in family planning, obstetric care and delivery, diagnosing and treating gynecological issues, menopause management, cancer screening, in-office procedures, and minimally invasive surgery. We are also home to Serenity Health Spa, which is dedicated to internal and external wellness and renewal.